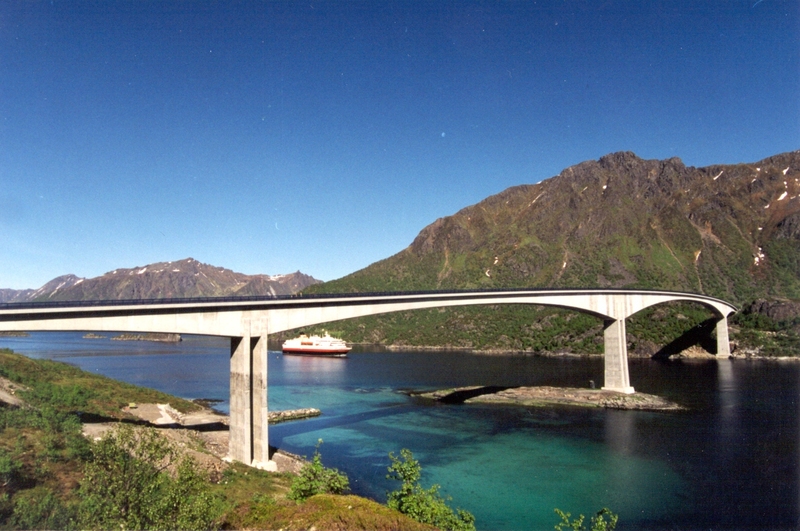 Raftsund Bridge is a balanced cantilever bridge with a main span of 298 metres and total length of 711 metres. 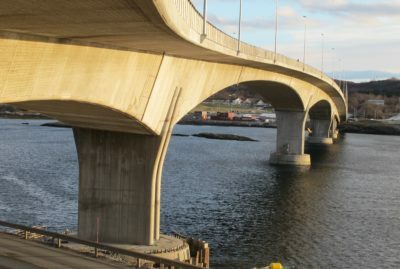 The bridge is part of Lofoten’s mainland connection (Lofast), and connects the island of Austvågøy with Hinnøy. Lofast is a stretch of road around 50 kilometres long, consisting of several tunnels and bridges between Gullesfjordbotn in Kvæfjord and Raftsundet in Hadsel municipality. When the main span was connected, it set a new record as the longest balanced cantilever bridge in the world. The bridge site is surrounded by an Alpine landscape with mountain peaks rising to 1000 metres above sea level. These subject the bridge to strong gusts of wind and high dynamic forces. The bridge was opened in December 1998. 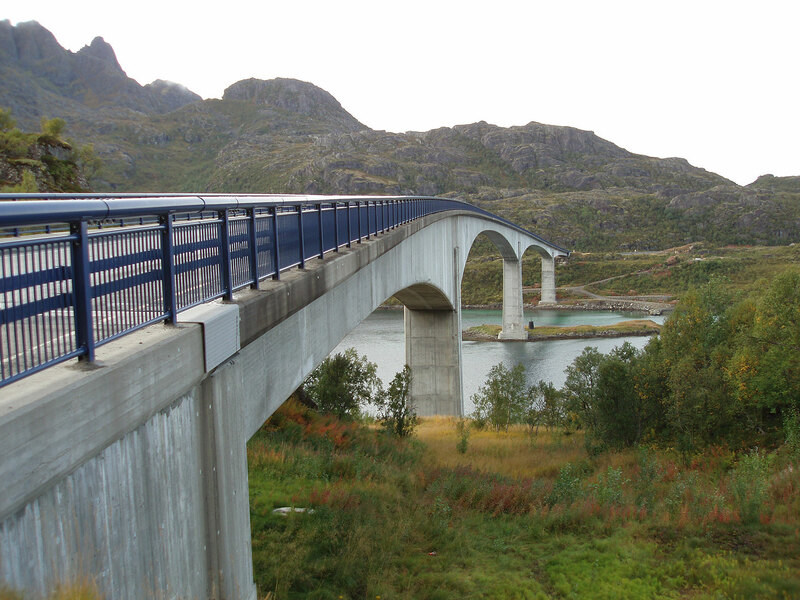 In 1991, the Norwegian Public Roads Administration announced an architectural competition for this bridge site. The competition had no restrictions in terms of design/bridge type. The topography in the region and the span length favoured a cantilever bridge or cable-stayed bridge. 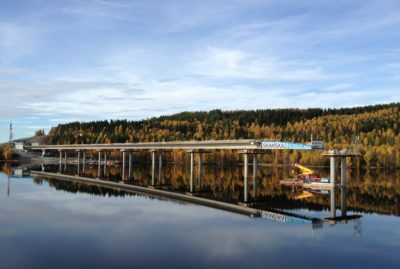 The jury decided that the cantilever bridge with a gentle curve proposed by Aas-Jakobsen in partnership with Boarch was best suited this bridge site, and the Norwegian Public Roads Administration then chose this concept for construction, with Aas-Jakobsen as its consultant. The bridge is made up of a total of four spans, all built using the balanced cantilever method. The deck height varies from 3.5 metres to 14.5 metres, with a roadway width of 9.4 metres including footpaths. The span lengths are 86m+202m+298m+125m=711m. The ship channel under the bridge is 45 metres high and 180 metres wide. 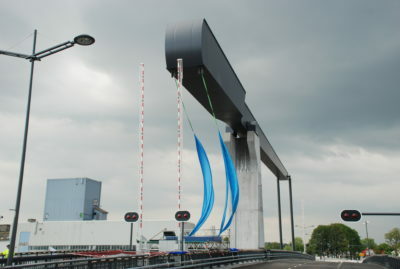 Around three quarters of the main span is made from concrete of strength class LC60, containing lightweight aggregate. The rest of the superstructure and columns are made from standard high-strength concrete with strength class C65. In each column axis, there are two slim flexible columns with the dimensions 8m x 2m/8 x 1.5m. The wind climate at the bridge site is extremely harsh. Aas-Jakobsen prepared plans and conducted measurements of the wind climate, which included an evaluation of wind parameters. This work resulted in the development of practical systems which are ideal for bracing at critical phases of construction. The bridge now stands as a sleek and elegant structure which is unobtrusive in the otherwise undisturbed Alpine landscape. Architectural competition and detailed design of the world’s longest cantilever bridge span.